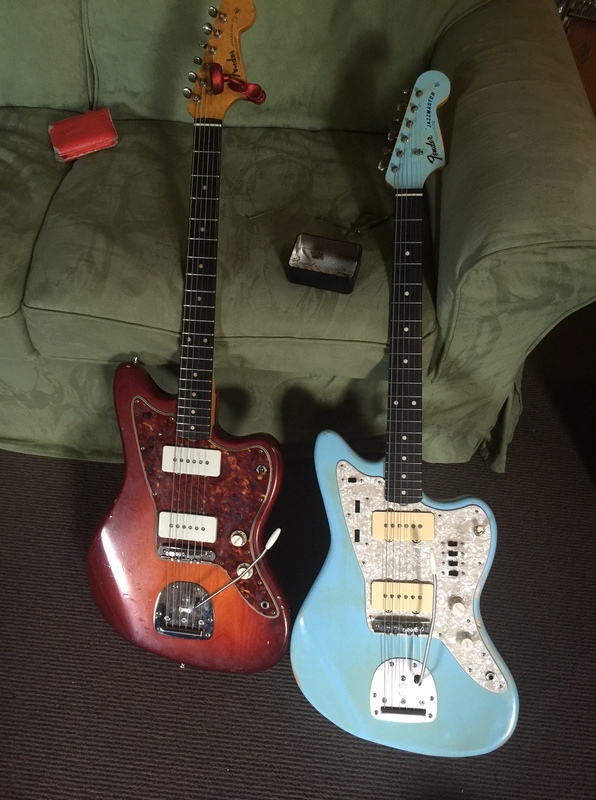 I love my Jazzmaster so much that i made another one with some juicy improvements . I bought the body and neck online , sealed and painted them in Daphne blue ( old fender colour ) nitro paint. The bridge and tremelo are from MASTERY who make the most beautifully crafted hardware. There is ZERO play in the tremelo which makes it feel so tactile and reliable . The pickups are from Curtiss Novak wired by Rothstein. It features a back pickup with 4 independent windings. 4 switches engage each winding , it can sound like a twangy Telly one minute and a honky Les Paul the next. My old red Jazzmaster ( 62 ) still is lovely and despite it looking a bit left-out is a better guitar —– only just .